About our model of positive growth – Joseph Ciarrochi, Ph.D.
ACT (pronounced as one word) is an approach to psychological interventions defined in terms of certain theoretical processes and a philosophical framework, not a specific technology. 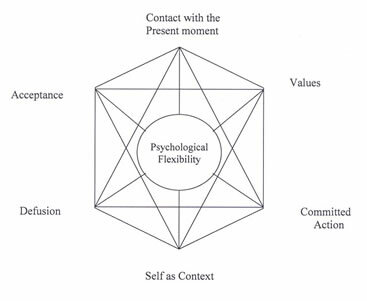 In theoretical and process terms we can define ACT as a psychological intervention based on modern behavioural psychology, including Relational Frame Theory (RFT) that applies mindfulness and acceptance processes, and commitment and behaviour change processes, to the creation of psychological flexibility. The general goal of ACT is to increase psychological flexibility. Psychological flexibility is established through six core ACT processes. Each of these areas are conceptualised as a positive psychological skill, not merely a method of avoiding psychopathology. Join one of the many e-mailings lists related to ACT The six core processes targeted in ACT Review of ACT mediational evidence: Does ACT work by promoting psychological flexibility?